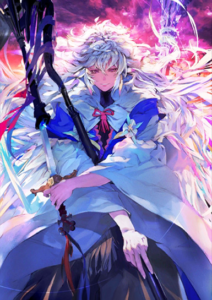 THIS ARTICLE CONTAINS THE STATS, STRATEGY, AND GUIDE FOR CASTER - MERLIN. WE WILL UPDATE THIS AS SOON AS THE GAME COMES OUT. Territory Creation C Increases damage of unit’s Arts cards by 6%. Item Construction C Increases debuff success rate by 6%. Mixed Blood EX Gain 5% NP Gauge per turn. Illusion A 1/3 9 Grants all allies invincibility for 1 turn. Increase critical star generation of allies for 1 turn. Decrease all enemies’ Critical Chance for 3 turns. Hero Creation EX 3/1 8 Increases one ally’s Buster card performance for 3 turns. Increases one ally’s Max HP for 3 turns. Increases one ally’s critical damage for 1 turn. HP recovery for party for 5 turns. Charge party NP gauge by 5% for 5 turns. Merlin is a wizard found in Arthurian legend who is said to be the king’s advisor during Arthur’s reign. According to his traditional origins, Merlin is born from a mortal woman and was sired by an incubus, and from this incubus he has inherited its supernatural abilities and powers. During his last days, he was bewitched and imprisoned by a woman known as the Lady of the Lake.